Catching any fish on any lure is always exciting, but if you haven’t yet caught a fish while using a top water lure, you’re definitely missing out on a whole other level of excitement. The sheer surprise and awe that comes from a bass assaulting a top water lure from below are just astounding. Loud, violent, and spectacular are just a few words to describe experiencing a large mouth bass clamp down on your lure quietly or noisily making its way across the surface of the water. Top water baits call for a couple different pieces of equipment; from rod selection to line selection, and, of course, the countless variations of top water baits. There are certain weather and forage conditions you must consider when top water fishing; such as water clarity, overcast or clear, the wind, and much more. To keep it simple, top water lures work the absolute best when they can be heard and seen from far away. This means clear glassy water, overcast, to give the lure a contrasting backdrop, and peace. In this article, we will cover a few of the most popular top water lures, how to fish them, and the equipment you need to fish them properly. Nothing is quite as exciting and awesome as frog fishing. When a large mouth bass comes up from below and absolutely smashes the frog, you have all of the sights and sounds that you would expect from a violent, trophy sized bass. Frogs are a staple of large mouth bass diet. They can be found relaxing on top of lily pads, on the stalks of reeds, or submerged in a few inches of water at the edge of a bank. By taking advantage of this knowledge and placing your lure appropriately, you can catch yourself a big hidden bass looking for an easy meal. 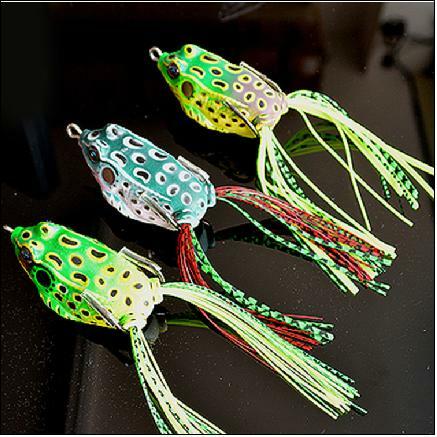 Floating frog lures are well known for landing trophy bass, but are also one of the hardest top water lures to fish due to how difficult it is to get a good, solid hookset. This difficulty can be avoided by equipping yourself with the proper gear to give you a confident hookset with plenty of hauling power. A heavy casting rod with a fast action. A magnum sized heavy rod may also be warranted if you are throwing the frog around heavy floating vegetation such as large lily pads. Reel speed can be disregarded, as the action will be coming from your rod, not your fishing reel. Only reel in slack. Braided line from 30 to 60#, or 20 to 30# monofilament depending on how thick the cover you’re fishing is. Frog lure of choice (most are hollow-bodied frogs with a double hook). Match the color to your local forage. Soft bodied frogs texas-rigged work well also. Cast your frog out to the area you are trying to cover. This area would ideally be covered with lily pads, grass, sticks & twigs, and other matted vegetation. Mimic the movement of a frog by “hopping” it a short distance, while adding in short pauses Many times the bass will take the frog during a pause, or sometimes you may even get a reaction strike if the bass can see the frog landing. Be sure to cover as much of the vegetation as possible – a few inches apart can make the difference between hooking up with no fish and hooking up with a monster hidden deep within the cover. When a bass bites a frog, it may be difficult to contain your excitement and you may feel the urge to perform a huge sweeping hookset immediately – don’t. Instead, allow one or two whole seconds before setting the hook to ensure the fish has the lure in his mouth. If you try to set the hook on a lure that isn’t hooked into anything, be prepared to duck and cover from the incoming lure. Bring a camera with you when you go frog fishing, because you’re sure to catch a giant at some point. Modern day poppers are designed to create a popping sound and spit water out in front. These two actions catch the attention of far away bass in the early morning or night while the walking and twitching motion of the lure itself provokes an attack. These treble hook lures float on the surface, with the back end dipping into the water. When an action such as a pull or a twitch is applied to the lure, it may leave a trail of bubbles, spit a stream of water in front of itself, and make a popping noise. Morning bass love to swallow these poppers whole, so be ready to set the hook! Medium action rod with a fast action. You don’t want to power this lure across the water. It should be fished with patience and strategy. Reel speed can be disregarded, as the action will be coming from your rod, not your reel. Only reel in slack. 10 – 15# monofilament or copolymer line. Braid with a mono leader is acceptable. Your choice of popper. Match the local forage for color and size. Start by casting the popper to a location near visible structure or cover. You want to be able to lure fish out of their hiding places with the popper since the treble hooks won’t let you get into the cover. Some anglers like to let the propagating waves dissipate before they begin their retrieve. In the same way you would fish a jerk bait, apply action by twitching or jerking the rod a couple of times. Add some regular pauses, allowing the waves to disappear between each cadence. If you can’t get bites this way, try quickly retrieving the lure by rapidly reeling; thus creating a trail of bubbles and a constant stream of water out in front of the lure. When you see your lure disappear, set the hook! – no need to wait for the treble hook lures. Walking baits are unsophisticated top water treble hook lures that rely on constant motion and vibration to attract fish. As the name describes, these lures appear to “walk” on the surface of the water as the proper action is applied to the rod. Darting from left to right, the walking lure creates an interesting zig-zag pattern in the water as well as a wake behind it. Bass are drawn to the sounds of the internal rattles and are mesmerized by the constant left to right action of these lures, causing them to strike. An effective early morning and early dawn technique, the walking top water lure is a classic old-school method of catching big hungry bass. Medium power fishing rod with fast action. 10 – 15# monofilament or copolymer line. Braid with mono leader is acceptable. Your choice of walking bait. As with all baits, match the local forage for color and size. The use of a medium action rod with a fast tip is absolutely necessary when trying to achieve a proper walking bait cadence. Too loose of a rod and your lure will oscillate too much, ruining your consistent zig zag pattern. Too strong of a rod and you won’t be able to establish a good rhythmic action to the lure – you would simply pull it back towards you with the lure veering off to one side dramatically. Cast the lure out into an ideally quiet and glassy body of water. Let the initial waves dissipate, and then begin your retrieve by bouncing the rod tip up and down with your wrist. Reel in slack as the lure gets closer, but only enough to keep a semi-slack line. The action should come from the semi-slack line being moved by your rod; not from the rod itself, as this would impart too much of an action on the lure, and create an unnatural or undesirable motion. Bass love to jump at these lures so be ready to set the hook as soon as one flies out of the water! As you might have already guessed, wake baits produce a V-shaped wake trail as they move through the water. They can be top water lures, but can also be found in subsurface variations as well. Both types make a similar V-shaped wake on the surface or just below, and mimic a small bait fish that has been separated from its group – easy prey for a large mouth bass. Wake baits are available as a single piece, jointed into many pieces, and may even include props, rattlers, and shallow-diving lips to add additional noise and vibration to the lure. Medium or medium-heavy power rod with fast action. Spinning or casting reel with 6:1 or 7:1 – fast enough to keep the lure on top. Your choice of wake bait. As with all baits, match the local forage for color and size. The key to this bait is to keep the lure as close to the surface as possible without completely breaking the surface or submerging too deep to create a V-shaped wake. 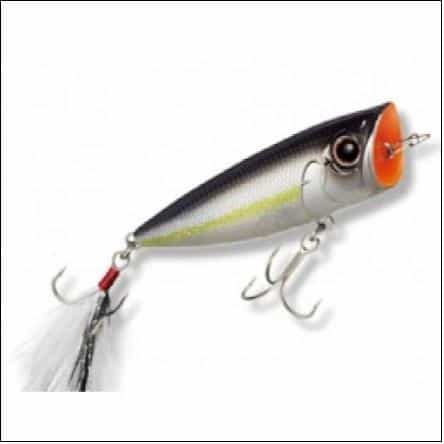 Because many of these lures come equipped with a lip to create a side-to-side wobble, it is important to fish this lure with the rod tip as high as possible, keeping the lure just at, or below the surface. Cast it out, and reel it back in fast enough that the lure stays on top, but not too fast that it doesn’t get enough exposure time on the water. As with all top water lures, these baits work best on quiet and glassy waters. In between grass beds or tulle patches is a great location to throw a wake bait as the V-wake attracts hiding bass. Buzz baits are excellent noise makers that’ll be sure to bring out the sunrise and sunset stalkers. 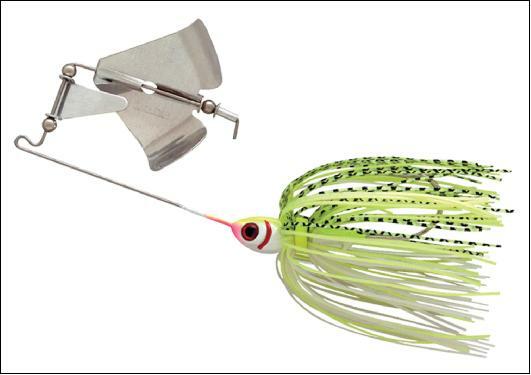 These lures are essentially swim jigs equipped with a “clacker” that works to make lots of noise, as well as create a trail of bubbles accompanied by a wake. They are single hooked baits, not treble hooked, and they remain relatively weedless because of the steel wire they are built upon. They can be sold with one or two clackers of varying colors and sizes, and some may even have only a prop with no clacker. These lures sink, so they require a constant retrieve to keep them afloat and making noise on the surface. Trailers or trailer hooks may be added for extra attraction, but excess bulk can negatively affect the action and buoyancy of the lure, so be sure to test the trailer out on the water. Spinning reel or casting reel with 6:1 or 7:1 – fast enough to keep the lure on top. Your choice of buzz bait. As with all baits, match the local forage for color and size. The buzz bait works well when cast parallel to a drop off or brush line. Cast the lure out as far as you can, and begin reeling the instant the lure hits the water. You want to get the lure to the top and making noise as quickly as possible. Reel in at a constant rate, watching your lure as you go. Bass may short strike these lures because of their length, so don’t set the hook unless you feel the fish on your line or see the lure disappear underneath. It may take several repeated casts in the same location to annoy a bass enough to come out of its hiding spot, but when it does, the result is quite rewarding. If you haven’t yet tried top water fishing before, do yourself a favor and get some lures. Experiment on a calm early morning, or on an early night after work. Experiment with different retrieve patterns and do your best to imitate the prey you are trying to mimic. With enough practice, you’ll be able to find a rhythm that the bass like, and you’ll know when and where to throw different kinds of top water lures. Remember it is always important to look around at your local forage before throwing any lure. If you see or hear a lot of frogs nearby, throw a frog! If you see bass chasing bait fish underneath the surface, throw a wake bait! Remember to bring a camera to document all of your catches because top water fish are typically worth bragging about, and your friends won’t believe you until they see it.